The Mindfulness Workbook for Addiction offers readers an effective program for working through their addiction and grief with cognitive behavior therapy (CBT), dialectical behavior therapy (DBT), and acceptance and commitment therapy (ACT). Created by two psychologists who work for Veterans' Affairs, this mindfulness training workbook is effective for treating the emotion dysregulation, stress, depression, and grief that lie at the heart of addiction. No matter the loss, the mindfulness skills in this workbook help readers process their grief, determine the function their addiction is serving, and replace the addiction with healthy coping behaviors. "The Mindfulness Workbook for Addiction is a brilliant blend of psychology and spirituality. 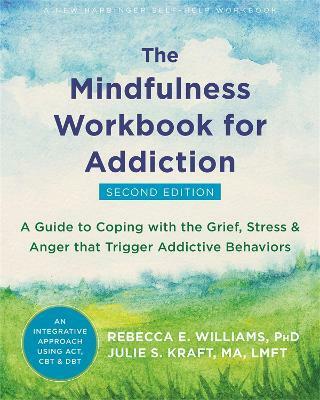 Williams and Kraft have written a breakthrough manual, clearly and intelligently laid out, that blends the most current understanding of addiction with the powerful practices of mindfulness. One of the best books on living with integrity we have read in years." --Michele H bert, author of The Tenth Door, and Mehrad Nazari, PhD, director of the Raja Yoga Institute "The authors have created a tool that can benefit all people who are dealing with addictions. The Mindfulness Workbook for Addiction integrates our best treatments for addiction and the emotional suffering that comes with it. This is a clear, step-by-step approach that will help readers move from trying (and failing) to avoid pain to living the life that they want to live, consistent with their values and free from the substance to which they are addicted. The focus on a nonjudgmental stance and acceptance of one's self while also facing challenges and changing behaviors provides readers with the key tools needed to change their lives." --John R. McQuaid, PhD, associate chief of mental health at San Francisco VA Medical Center, professor of clinical psychology in the Department of Psychiatry at the University of California, San Francisco and coauthor of Peaceful Mind "Williams and Kraft teach readers in a clear, compassionate, and concise way how to observe painful feelings as they arise. By learning how to tolerate and investigate their present-moment experiences, readers can stop harmful behaviors and make more valued life choices. This guide will be an essential addition to the library of anyone struggling with addiction and difficult emotions, and for all therapists who want to utilize an effective approach to help people live fuller, healthier lives." --Shoshana Shea, PhD, clinical psychologist focusing on mindfulness-based cognitive therapy in San Diego "The Mindfulness Workbook for Addiction is a practical, easy-to-read book that addresses addictions of all varieties. The workbook is rich in offering tools and insights that everyone can benefit from, whether they struggle with an addiction or not. The authors nicely use case examples and metaphors to bring the concepts alive. This will be a valuable resource to anyone seeking to learn new skills for overcoming an addiction." --Lee Williams, PhD, professor of marital and family therapy at the University of San Diego and co-author of Essential Assessment Skills for Couple and Family Therapists "With an engaging and conversational tone, Williams and Kraft show you how to change the energy of addiction. Their practical strategies allow addictive personalities to dig deep and tackle the genesis of their destructive behaviors and trigger positive-mindset solutions for living a more powerful life." --Stacey Canfield, author of The Soul Sitter Handbook "With warmth and patience, The Mindfulness Workbook for Addiction guides the reader step-by-step through a journey toward self-understanding, self-acceptance, responsibility, and healing. With practical knowledge of how painful emotions drive us to act against our own well-being and how to free ourselves from this struggle, Williams and Kraft have provided an invaluable resource for people in recovery and the therapists who aid them. Mental health professionals are offered a comprehensive map of the emotional ground traveled in recovery from addictions and other self-defeating behaviors, with spot-on teaching stories that illustrate each stage of the process." --Laura E. Forsyth, PhD, supervisor of psychological counseling at Moorpark College and psychologist in private practice serving adults with ADHD, depression and anxiety in Camarillo, CA "Refreshing, unique, and practical. The Mindfulness Workbook for Addiction is an impressive synthesis of Eastern and Western techniques designed to help those struggling with addiction find a path towards healing and transformation. Through the use of mindfulness practices, cognitive-behavioral exercises, case examples and relevant metaphors, the authors entice readers to actively participate in their own recovery. This workbook offers creative, new ideas and practical recovery tools designed to facilitate real and lasting change. I can't wait to use it with my clients!" --Phylis Wakefield, PhD, psychologist, specialist in addiction and trauma and coauthor of Couple Therapy for Alcoholism "What a gift! This wonderful workbook will help you understand how addictions function as a false remedy for negative feelings. It is packed with stories, metaphors, worksheets, and activities that will teach you how to befriend your mind and use it as a resource for recovery and fulfillment. The authors use everyday language to describe the complexities of the human condition, and help you systematically learn and practice skills to accept your feelings, live with integrity by honoring your values, and enrich your relationships. The workbook can be used by individuals or groups and will make a great adjunct for psychotherapy." Rebecca E. Williams, PhD, is a clinical psychologist specializing in recovery from mental illness and addictions. She is director of the Veterans Administration San Diego Healthcare System's Wellness and Vocational Enrichment Clinic and the Psychosocial Rehabilitation and Recovery Center. She is currently associate clinical professor in the Department of Psychiatry at the University of California, San Diego and adjunct faculty at the University of San Diego. She is coauthor of Couples Therapy for Alcoholism.